You’ve written a new blog post, now you’re ready to share it with the world. But…you’re not exactly sure what you need to do next. I can tell you first hand from experience that you cannot just sit around and wait for people to show up and read your blog posts. If you want to get your content in front of a wider audience — more specifically targeted readers, you will need to invest some time into marketing your content. Sharing your content on the web needs be an integral part of your marketing strategy and the success of your blog posts depend on it. But….before you hit the publish button and even after you launch your blog post there are some there are some things that you need to do to make sure that you get as much mileage out of your blog posts as possible..
Later on in the post, I will cover a list of things that you need to before and after publishing a blog post. Are you familiar with the concept of content marketing? Unless you’ve been under a rock, this concept has been a “buzzword” for quite some time now. As I alluded to in my previous post that covers 15 ways to get serious about blogging – content marketing is a highly effective strategy that every small business should use for growth + client attraction…especially for building a solid online business presence. 76% of marketers are increasing investment in content marketing. Clearly, these stats prove that content marketing is a worthy investment for businesses large and small. Now, I want to make sure that I go on record and state that: blogging is not content marketing and content marketing is not blogging. Blogging involves adding new content (aka blog posts) to your blog regularly. Whereas content marketing is publishing your blog posts to various platforms via the web”. I won’t lie, when I first started blogging I thought that blogging and content marketing were one in the same…until one of my favorite bloggers and entrepreneurs cleared things up for me. (Please don’t judge me)…. I’ve since learned that they are two separate things, but when used in conjunction with one another make for a powerful marketing combination. It is through marketing that people will find and read your content on the web. Now, obviously, there is a lot more involved in content marketing, but this is a simple breakdown of how the process works. 1.Check the post for grammatical and spelling errors. You’re human and mistakes will happen, but before publishing a blog post, you should always scan your content for spelling and grammatical errors. Put yourself into your reader’s shoes. If someone stops by to check out your content and it’s full of spelling errors and etc., it will leave a bad impression. So you should always take the time to check your work. Polishmywriting.com has a great spelling and grammar checker that you can run your content through to make sure its good to go. I am using WordPress to run this site and the Yoast SEO plugin to optimize my content the search engines. 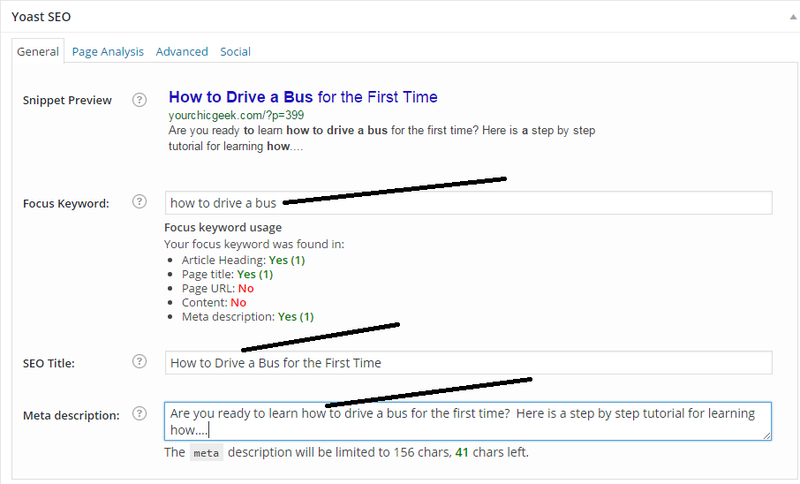 To do this, I add my keywords to the Title of my blog post, the meta description, throughout the blog post, and the SEO Title box of the Yoast Plugin. Title tags tell the search engines what your blog post is about . Heading 3 and so forth. This is one of the many topics that I cover in my Blogging for Business Toolkit — that includes checklists, guides and blogging strategies that you can use to maximize your blogging efforts online. 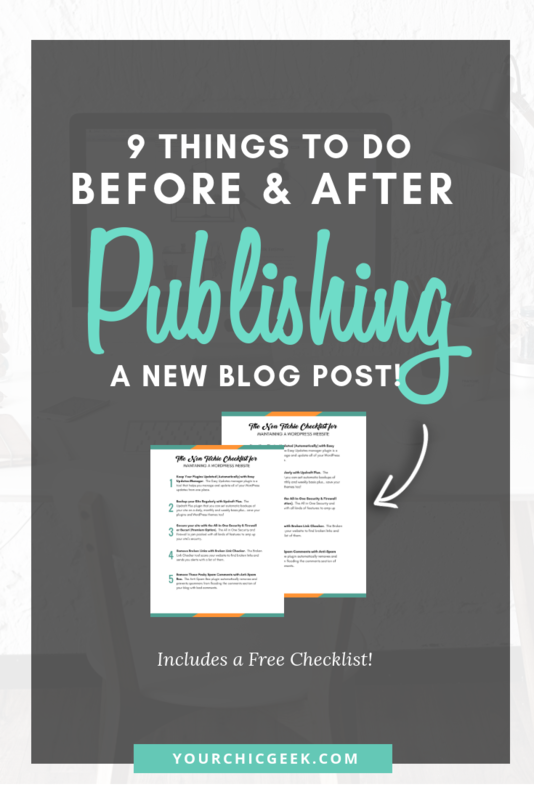 CLICK HERE to download my free 9 step checklist for publishing a new blog post. I’m not an SEO expert by any means, but these are some of the basics that you can use to optimize your content for search. Important Note + Word of Caution: Please be careful about overusing your main keyword too many times in your content. This is referred to as keyword stuffing and is a practice that could cause your content or blog to get penalized by the search engines. Visual content is huge these days guys. So much so that Images and photos are the most important tactic in optimizing social media posts. 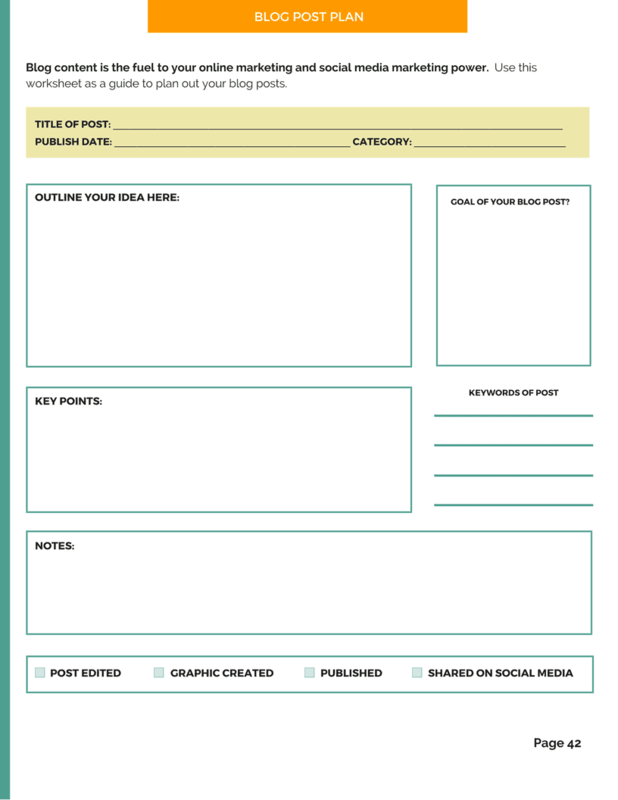 Canva is the resource that I use and highly recommend that you use as well to create all of the images for your blog posts. 5. Optimize visual content for the search engines. Optimizing your images for the search engines is just as important as your content. To do this in WordPress, you simply add your main keyword to the ALT Text box in your dashboard. This basically tells the search engines, that if a user searches for “Your Keyword Topic”, that your image is related to that subject. When readers opt in to your newsletter it indicates that they are interested in hearing more from you. As such, every time that I publish a new blog post, I make sure to share those posts with my newsletter subscribers and.. ask them to share the content as well. 7. Reach out to friends and peers asking if them to share the content with others. This my friends is the power of relationship building and network marketing. I have a pretty close knit community of fellow entrepreneurs and bloggers that I have established relationships with. Because of the relationships that I have formed with them, they are more than eager to share my content on their social networks and to their communities — and I in turn do the same for them. In case you haven’t noticed, I am a huge proponent of using social media networks. In truth, I used to think that social media was just another thing… a fad…something else to pile on the ever growing to do list. But these days, I stand corrected. I believe that getting active on social media networks is an absolute necessity these days for small businesses that want to get their content in front of more readers. As soon as my blog posts are published, I head on over to my active social networks to start sharing the content. If someone takes the time to drop by and leave comments on your blog posts – be sure to respond to them. It’s just common courtesy and it’s important for building relationships with your readers as well. If you really want to learn the power of blog commenting for your business, head on over to super star blogger Adrienne Smith’s blog to see how she engages with her community. Adrienne also has a fantastic course Build a Blog Community that I have recently taken and boy was it eye opening. 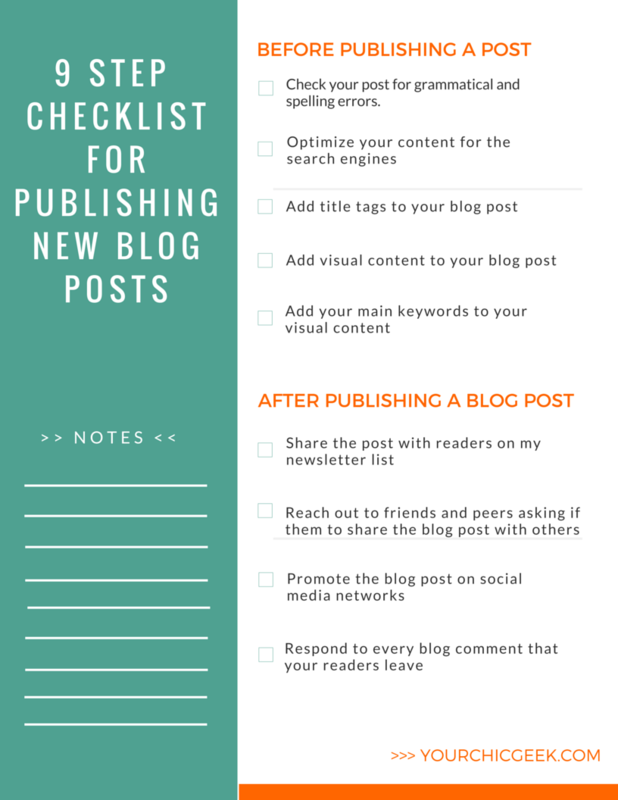 So…I have wrapped up the list of 9 things that you should do before and after publishing a blog post. I hope that this post has been helpful for you and wish you all of the best with your blogging and content marketing endeavors. If you enjoyed this post, I would love for you to share it with your friends on social media. Where would you like me to send your free worksheet? I hate spam as much as you. Your email is safe with me. Where would you like for me to send your free checklist?